Title text: The captain has turned on the 'fasten seat belt' sign. A total solar eclipse occurred on Monday, August 21, 2017. 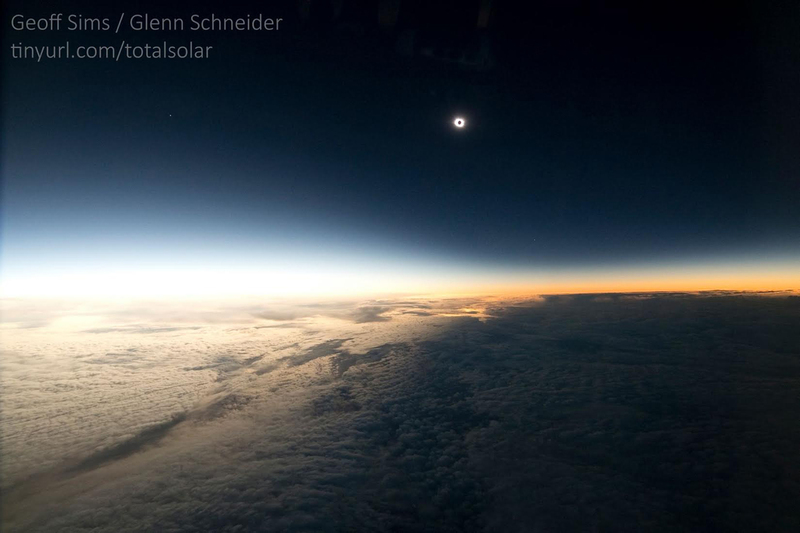 It was visible as a total eclipse in a narrow band across the contiguous United States from Oregon on the Pacific coast to South Carolina on the Atlantic. Cueball asks Megan what she is doing, which turns out to be mapping the flights of aircraft that will be flying through the path of totality during the eclipse. She has found between 50 to 100 such flights. While most flights during the eclipse are coincidental, a few airlines had special flights planned for the occasion. Alaska Airlines, for example, chartered an invitation only flight for about 50 astronomers and serious eclipse chasers. On the map, the center of the greatest eclipse is shown on the border between Illinois and Kentucky. Cueball says that the airlines and pilots will be prepared and aware of the situation, but Megan wonders what it would be like on a plane with an unprepared crew. The last panel shows a plane flying into the area of the eclipse with one of the crew telling the passengers that the end of the world has come. In many cultures such as ancient Egypt, the end of the world is represented by a great darkness and the sun going out. During past eclipses, people were said to have believed the world was ending much like this comic (except without planes). This could also be a reference to 1391: Darkness as in that comic the reporters also believed a natural event to be the world ending although in a different setting. The title text refers to the 'fasten seat belts' signs on display for the passengers, as a precautionary measure for turbulence. Many pop-culture depictions of the end of the world feature storms, earthquakes, tsunamis, volcanic eruptions, etc; as the captain believes that the end of the world is upon them, he feels it safe to ensure his passengers are prepared for turbulence from any of the phenomena that occur during the end times. However, the precaution of having one's seat belt fastened is vastly insufficient when confronted with such catastrophic events. This was the first reference to the Eclipse within a month of the totality. It was followed less than three weeks later by 1876: Eclipse Searches. The 2017 eclipse was mentioned as early as 2013 in the title text of 1302: Year in Review. And this year's New Year comic, 1779: 2017, also mentions it. Both comics express concern, in the title text, that it would be canceled/not happen. Megan: Flight plans. Looks like there will be 50 to 100 flights whose route puts them in the path of the eclipse next month. Cueball: I'm sure the airlines will be prepared. Pilots know that stuff. Megan: But can you imagine being on the one flight where the pilot didn't? Captain: Folks, this appears to be the end times. While we often sketch the penumbra as uniform, in reality the penumbra shades gradually from the completely dark umbra out towards the edges. The reason is simple: as you move outwards away from the edge of the umbra, you will see an increasing fraction of the Sun peeking out from behind the Moon. 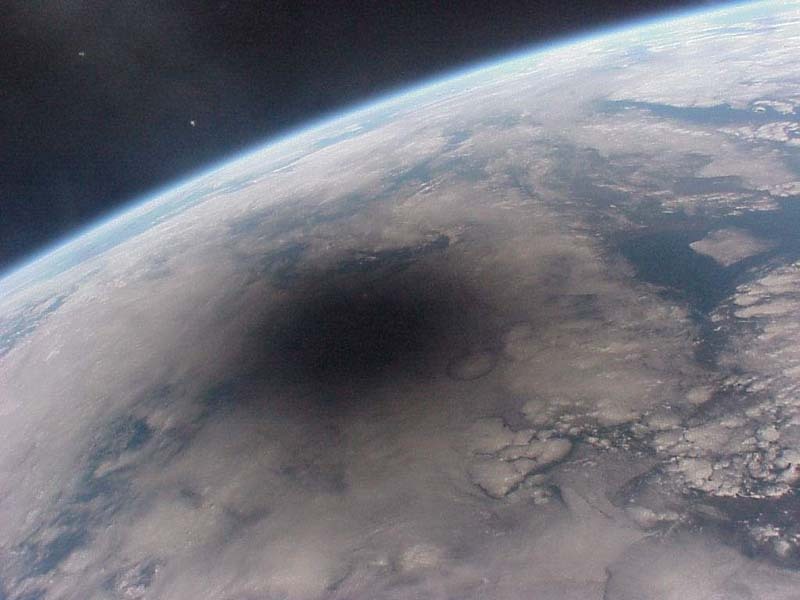 There is a very nice Mir image of the 1999 Aug 11 eclipse shadow showing what I mean. This page was last edited on 18 July 2018, at 13:00.